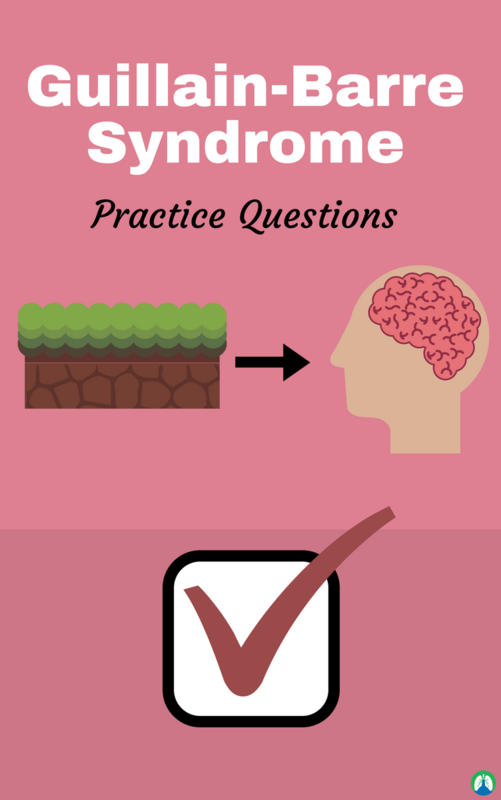 I hope you’re looking for Guillain-Barre Syndrome practice questions, because that is exactly what you will find in this study guide. My name is Johnny Lung and it is my mission to help as many Respiratory Therapy students as possible. And to do that, I need to share with you some of the best information that covers everything you need to know about the pathology and diseases that you will see while practicing as a Respiratory Therapist. With that being said, this one is all about Guillain-Barre Syndrome. So take your time and go through the practice questions listed below until you learn and understand the information. Let’s dive right in! 1. What is Guillain-Barre Syndrome? It is an acute, rapidly progressing polyneuritis that causes ascending symmetrical paralysis. It is an autoimmune disorder (that is rare) of the peripheral nervous system (PNS) in which the flaccid paralysis of the skeletal muscle and loss of reflexes develop, usually in a person that was previously healthy. 2. 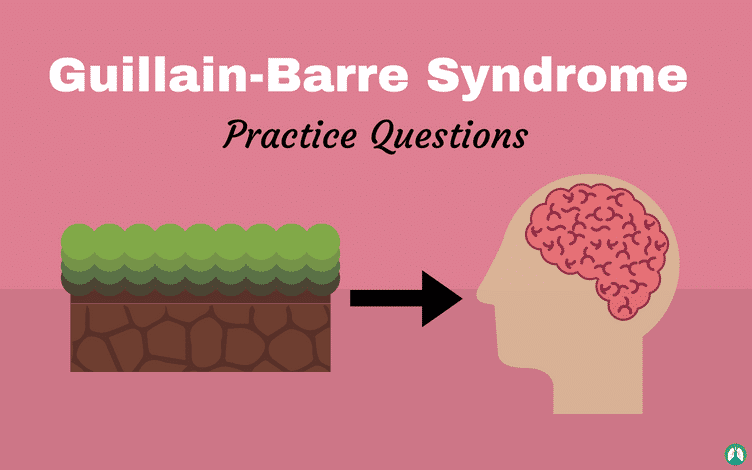 What does Guillain-Barre affect? If effects cranial nerves and the peripheral nervous system. An autoimmune (viral infection, trauma, surgery, or viral immunization) that leads to demyelination, edema and inflammation. 4. What are the clinical manifestations of Guillain-Barre? Weakness, paresthesia, paralysis, hypotonia, areflexia, ANS dysfunction, pain, SIADH (syndrome of inappropriate antidiuretic hormone secretion), and respiratory failure. 5. What investigation is done to diagnose Guillain-Barre? History, physical exam, CSF analysis, EMG, nerve conduction tests and brain MRI. 6. What care should be done for patients with Guillain-Barre? Mechanical ventilation, plasmapheresis, IV immunoglobulins, vasopressors and nutrition. 7. What can occur in severe cases of Guillain-Barre? Paralysis of the diaphragm and ventilatory failure. 8. What can develop from Guillain-Barre? Mucous accumulation, airway obstruction, and atelectasis. 9. What happens to the myelin sheath due to Guillain-Barre? Demyelination and inflammation can occur. 10. What causes paralysis in Guillain-Barre? It prevents the ability of the neurons to transmit impulses to the muscles. 11. How does Guillain-Barre spread? From the ground to the brain, it starts at the extremities and works towards the head. It’s an ascending disorder. 12. What is the precise cause of Guillain-Barre? The precise cause is unknown. 13. What antigen causes the infections in Guillain-Barre? Campylobacter jejuni causes 60% of the infections in Guillain-Barre. 14. What elevated levels are present in Guillain-Barre? Antiganglioside antibodies and protein levels (also normal/decreased WBC). 15. What factors are more susceptible to Guillain-Barre? Being Caucasian (50 to 60% more likely) and being >45 years of age. 16. What is the clinical presentation of Guillain-Barre? Symmetric Muscle Weakness with tingling, burning, shock-like sensations; throbbing pain; numbness to extremities, face, and trunk can occur; drooling and difficulty swallowing; and, respiratory muscle paralysis. 17. What percent of people with Guillain-Barre make a full recovery? 90% (10% have long-term neurological deficits). 18. How long is the recovery time for Guillain-Barre? 6 months to two years but not much recovery after 2 years and may be as long as 3 years. 19. What history do patients of Guillain-Barre have? Sudden onset of weakness, abnormal sensations that affect both sides of the body and loss of reflexes, such as knee-jerk. 20. What are the clinical Indicators of ventilatory failure? FVC: <20 ml/kg; MIP: < -30 cmH2O; NIF: < -20; MEP: <40 mmHg; Ph: < 7.35; and, CO2: > 45 mmHg. 21. What are the types of bronchopulmonary hygiene for managing Guillain-Barre and lung expansion therapy? CPT, flutter value, acapella and IS therapy. 22. What is found not to be effective in treating Guillain-Barre? Corticosteroids are found not to be effective in treating Guillain-Barre. 23. What breath sounds do patients of Guillain-Barre have? 24. What are the vital signs for Guillain-Barre patients? Heart rate is increased, respiratory is increased, and oxygen saturation is decreased. 25. What will the chest x-ray for Guillain-Barre patient look like? It will appear normal or slight decrease in expansion. 26. What will be seen on chest percussion for a Guillain-Barre patient? 27. What will be the ABG of a Guillain-Barre patient? 28. What are the Guillain-Barre Diagnostic tests? Spinal tap, electromyography and nerve conduction studies. 29. What type of airway disease is Guillain-Barre? 30. What type of disease is Guillain-Barre? 31. What is the other name of Guillain-Barre Syndrome? 32. What type of disorder is Guillain-Barre Syndrome? 33. What are the other causes of Guillain-Barre Syndrome? Viral, bacterial infection, surgery, or vaccinations. 34. What will develop in the 2/3 of patients within 2 months of contracting Guillain-Barre Syndrome? 35. What conditions will 90% of Guillain-Barre Syndrome patients have within one month of the disease? 36. How do lesions with Guillain-Barre Syndrome happen? 37. From where do lesions occur? Spinal roots to distal termination of motor and sensory fibers. 38. What is the primary target of Guillain-Barre Syndrome? 39. How does demyelination occur with Guillain-Barre Syndrome? There is a generalized inflammatory response and myelin is stripped from the nerves. 40. When does classic acute Guillain-Barre Syndrome peaks? 41. How do motor deficits, sensory deficits, and weakness present with the classic acute form? 42. What kind of recovery do Guillain-Barre patients have? Often complete or near complete. 43. Why does Guillain-Barre Syndrome have flaccid paralysis? 44. How long does recovery take? 45. What condition of patients that may result in a poorer recovery? The older patient, late initiation of treatment and with axonal degeneration. 46. What is very important to do with patients with Guillain-Barre? Positioning, bed mobility, ROM, and plasmapheresis. 47. What residual effects with Guillain-Barre most likely to be? 48. What are the signs and symptoms of Guillain-Barre Syndrome? Tingling of UE and LEs, paralysis, symmetrical weakness upwards, bulbar involvement, areflexia, pain, orthostatic hypotension, facial droop, bilateral paresthesia, difficulty with eye or facial movement including speaking, chewing and swallowing, and difficulty with bladder control. Other symptoms are sensory impairments, motor weakness, pain and muscle aches, hyporeflexia and autonomic dysfunction. 49. What are the risk factors for Guillain-Barre Syndrome? Epstein Barr virus, HIV, and mycoplasma pneumonia. 50. What is the pathophysiology of Guillain-Barre Syndrome? Damage to myelin, muscle paralysis, sensory disturbance, and autonomic dysfunction. Acute inflammatory demyelinating polyradiculoneuropathy characterized by areflexia. Flaccid paralysis affects limb movement, facial muscles, dysphagia, dysarthria, and respiration. Neurologic dysfunction includes a humeral immune reaction that blocks conduction of nerve impulses to muscle leading to paralysis and cell-mediated immune reaction where macrophages attack myelin surrounding nerve fibers. 51. What are the types of Guillain-Barre Syndrome? Acute inflammatory demyelinating polyradiculoneuropathy in USA; Miller Fisher syndrome eyes in Asia; and, acute motor axonal neuropathy in China. AIDP: Acute inflammatory demyelinating polyradiculopathy; AMAN: acute motor axonal neuropathy; AMSAN: acute motor sensory axonal neuropathy; APN: acute panautonomic neuropathy; and, PSN: Pure sensory neuropathy. 52. What is the prognosis of Guillain-Barre Syndrome? The distal compound motor action potential (CMAP) is a predictor of prognosis. If the CMAP amplitude is less than 20% of normal limits at 3-5 weeks, it predicts a prolonged or poor outcome. 3%-5% die from systemic organ failure. Most common long-term effects are a weakness of pretibial muscles and less often in hands, feet, and quadriceps and gluteal muscles. Most of the recovery is during the first year with greatest within 6 months. Studies show 1/5 of patients noted improvements 2.5 years or 6.5 years after GBS. 2 w- 4 w – 12 months and children recover. 53. What are the treatments for Guillain-Barre Syndrome? Plasmapheresis, intravenous immunoglobulins, intubation, and glucocorticoids. 54. What is the etiology of GBS? Evidence supports that it is an immune-mediated disorder. Causative factors are, Bacterial: campylobacter jejuni that is identified cause of preceding infections in 60% of patients and axonal type; and, Viral: CMV, greater sensory, demyelination, Epstein Barr and mycoplasma pneumonia. 55. What is the onset of GBS? No identified illness (~27%), 2/3 had symptoms of an infectious disease two weeks before onset of GBS symptoms, of 2/3 patients reporting acute infection, 90% had illness in prior 30 days, respiratory and G.I. 56. What is required for the diagnosis of GBS? Progressive weakness on more than one extremity (symmetrical presentation) and areflexia. 57. What symptoms are supportive of diagnosis in order of importance? Weakness developing rapidly that ceases to progress by week four, symmetric weakness, mild sensory, facial weakness common and symmetric (oral-bulbar), musculature may also be involved, and recovery usually begins after 2-4 weeks after progression ceases, tachycardia, cardiac arrhythmias, and labile BP may occur and absence of fever. 58. What cerebrospinal fluid features are seen inGuillain-Barre patients? CSF protein (albumin) levels increased after 1 week; continue to increase on serial examinations, and, CSF contains 10 or fewer mononuclear leukocytes/mm3. 59. What are the comorbidities of Guillain-Barre? Essential hypertension, urinary-tract infection, acute respiratory failure, diabetes mellitus, anemia and constipation. 60. What are the complications of Guillain-Barre? Pressure sores, wounds, contractures, DVT / pulmonary embolism, HTN, sinus tachycardia, cardiac dysrhythmia, bladder dysfunction, G.I. motility disorder (PEG tube), depression and pneumonia. 61. What type of disease is Guillain-Barre classified as? Acute polyneuropathy and peripheral nervous system disease. 62. How does Guillain-Barre start? It is often preceded by an event such as a mild respiratory or GI infection, viral or bacterial infection or surgical procedure. 63. What types of bacterial and viral infection are associated with Guillain-Barre? Cytomegalovirus (herpes), Epstein-Barr (mono) and HIV. 64. What is the overall difference when treating Guillain-Barre patients versus MS patients? The GBS patients will be getting better so we need to plan accordingly and minimize any type of compensations or adaptations. For MS patients as they get worse we may teach them adaptations and compensations. 65. What are the symptoms of Guillain-Barre? Paresthesia, LE weakness, sensation deficits, respiratory problems and autonomic abnormalities. 66. What is the pathology of Guillain-Barre? Lymphocytic infiltrates deposited on the surfaces of the myelinated fibers, leads to degeneration of myelin. Later axonal involvement and Wallerian degeneration occurs. 67. What is a difference in MS that we see with Guillain-Barre? We see Schwann cell proliferation and axonal regrowth in GBS. 68. How is Guillain-Barre diagnosed? CSF protein and nerve conduction velocities. 69. What is the sensory pattern for Guillain-Barre? 70. What is some common sensory impairment for Guillain-Barre? 71. What type of motor weakness do we see with Guillain-Barre? 72. What parts of the body are affected last with motor weakness in patients of Guillain-Barre? Trunk, intercostal, cranial nerves, face, and respiratory system. 73. What type of autonomic dysfunctions do we see with Guillain-Barre? Fluctuating BP, decreased cardiac output and bradycardia. 74. What are the medical treatments for Guillain-Barre? Plasma exchange and immunoglobulin therapy. 75. How does plasma exchange work? Removes plasma and gets out antibodies then it is returned to patient similar to dialysis. 76. How does immunoglobulin therapy work? Blocks antibodies from binding to sites. 77. What important things need to be noted about the history of Guillain-Barre? The onset and pattern of symptoms as this provides significant information if they are getting worse or recovering and guides therapy. 78. How do you test MMT with patients of Guillain-Barre? Specific and regularly (1x week) to monitor improvement. 79. What is a sign of muscle denervation? 80. Why is ROM an important aspect of Guillain-Barre therapy? The patients are expected to fully recover so maintaining ROM is an important aspect in order that it does not hinder recovery. 81. What is an important aspect of gait training for patients with Guillain-Barre? Avoid compensations. May use AD to avoid patient from compensating so that there is no need to overcome the compensations when the patient begins to recover. 82. Why are reflexes particularly useful for the patients with Guillain-Barre? It can give an indication of what is going on with innervation of the muscle. 83. What needs to be avoided when strengthening patients who have Guillain-Barre? Wow, congratulation for making it to the very end of this study guide on Guillain-Barre Syndrome. I truly hope that these practice questions were able to help you learn more about this disease. I’m confident that if you go through them again and again, you will definitely learn what’s required of you and more. Thanks again for reading and as always, breathe easy my friend.